Stanley's been unjustly sent to a boys' detention center where the warden makes the boys build character by digging holes. Stanley realizes the boys are digging holes because the warden is looking for something. But what could be buried under a dried-up lake? Stanley Yelnats is under a curse. A curse that began with his no-good-dirty-rotten-pig-stealing-great-great-grandfather and has since followed generations of Yelnatses. 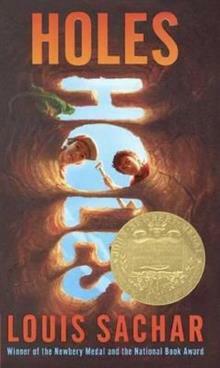 Now Stanley has been unjustly sent to a boys' detention center, Camp Green Lake, where the warden makes the boys build character by spending all day, every day, digging holes: 5 feet wide and 5 feet deep. It doesn't take long for Stanley to realize there's more than character improvement going on at Camp Green Lake. The boys are digging holes because the warden is looking for something. But what could be buried under a dried-up lake? Stanley tries to dig up the truth in this inventive and darkly humorous tale of crime and punishment -- and redemption.